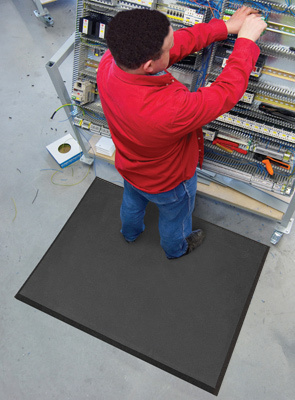 Superfoam™ is an extremely lightweight safety anti-fatigue mat designed especially for ease of handling and ergonomic comfort. Made from closed cell PVC Nitrile foam blend, Superfoam™ does not absorb liquids and is highly resistant to greases, oils, animal and vegetable fats. This allows it to be used in areas where occasional overspray and dripping occur such as dishwashing stations and bar areas. Because Superfoam™ is lightweight, it's the perfect mat for areas where mats are regularly moved for cleaning like cooking lines, service counters and food prep stations. Closed cell PVC Nitrile foam blend does not absorb liquids. Highly resistant to greases, oils, and animal and vegetable fats. Lightweight for easy handling and cleaning. Perforated version with drainage holes to facilitate removal of liquids and debris.